Whilst chatting in the comments to the Burmese with Arsenus Lupenus it occurred to me that the big Burmese elephant with a crew reminiscent in numbers to a large McDonald’s outlet looked as much a piece of fantasy fiction as it did an historical miniature. I then started to think of what I could use it for in a Hordes of the Things army. What conjured the images of elephants? Tarzan movies certainly. I recall whenever one of the natives was about to be crushed by an elephant a look of absolute fear would come into his eyes and he would scream out the word “tondo!” which I took meant, when translated from Swahili to English, “bugger, I am about the be crushed by an elephant”! Amusing certainly but not really HotTish around elephants. I mean, I could do a jungle themed HotT but I would need to add hunters, Tarzan, natives and so on. I wanted something elephantish. The 1954 movie Elephant Walk then came to mind. It starred Elizabeth Taylor, Peter Finch and some other blokes and was set in Sri Lanka before Sri Lanka was Sri Lanka and whilst it was still British Ceylon. The tagline was “one man claimed the land. Two men claimed the woman who lived there.” So, the typical love story – he loves her, she loves the other bloke and the other bloke is bowling from both ends! It wasn’t the love story or the heat, passion and jungle that was interesting for me but rather that, as I remembered, the elephants seemed to have it in for Elizabeth. Hmm, today it is Angry Birds, in 1954 it’s Angry Elephants. Now we are starting to get more HotTish. Of course, if you are thinking about a movie called Elephant Walk, your mind is going to remember that piece of music called Baby Elephant Walk from Henry Mancini in 1962 movie Hatari ((or you mind turns to that if you are older than 45 I guess)). Click the link and listen to it. 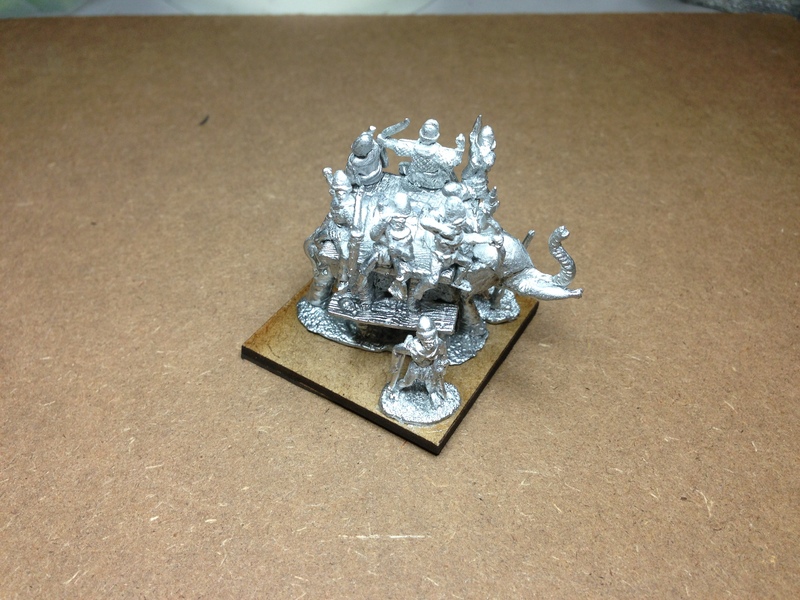 A good mobile army, a bit restricted by bad terrain but the appearance of it on the other side of the table will likely cause a good degree of consternation in your opponent, leastwise once they get over the oh’s and ah’s as everyone loves a Nellie on the table. It has been a few years since I have built or painted any HotT armies but I am tempted to do this one just for the fun of it. If anyone does build it, let me know and send me picture please.